The quieter half of Goa, the swaying palms and immaculate beaches is just what you want if you just want to unwind, away from the noise and the crowds. This part of Goa is more about the beaches and trance, though there is plenty of this too, in cleaner beaches and less crowded parties. South Goa extends from Zuari River in the north, till the border of Karnataka in the south. The South is perfect for a honeymoon or for staying at an upscale resort with beachside views. It also has great options for the backpacker. South Goa’s villages must be explored for the gentle pace of life there and for the rich history of Portuguese and Indian culture tucked away in the sleepiest little hamlet. If you don’t have the time to go through the entire post, we’ve put together a small cheat sheet to help you make a quicker decision about where to stay in South Goa. If you’re wondering where to stay in South Goa, we’ve also got a curated set of resorts and hotels that you can book. Explore Best Places To Stay In South Goa. Continue reading for a more detailed guide to South Goa. Trains are usually at a significant distance away from the beaches. There are plenty of local buses in South Goa. We recommend travelling by road by taxi or renting a car or bike. There’s also the unique ‘pilot’, or motorcycle taxi to choose from. Margao is almost an hour away from Panjim. Margao has a pretty good system of buses, which take you to most of South Goa’s beaches. Here is an overview of some of the best places of South Goa, arranged in geographical order of their distance from Panjim. 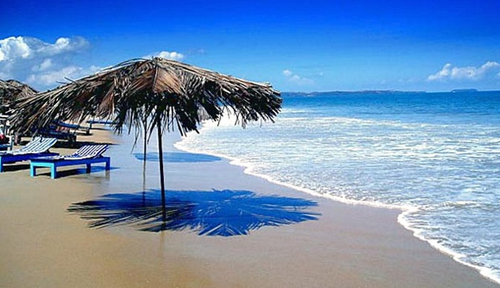 Colva is the most popular beach in South Goa, probably because it is closest to the capital. This is where you should be if you want to be part of great parties and indulge in some water sports. Go boating, parasailing, water skiing, etc. 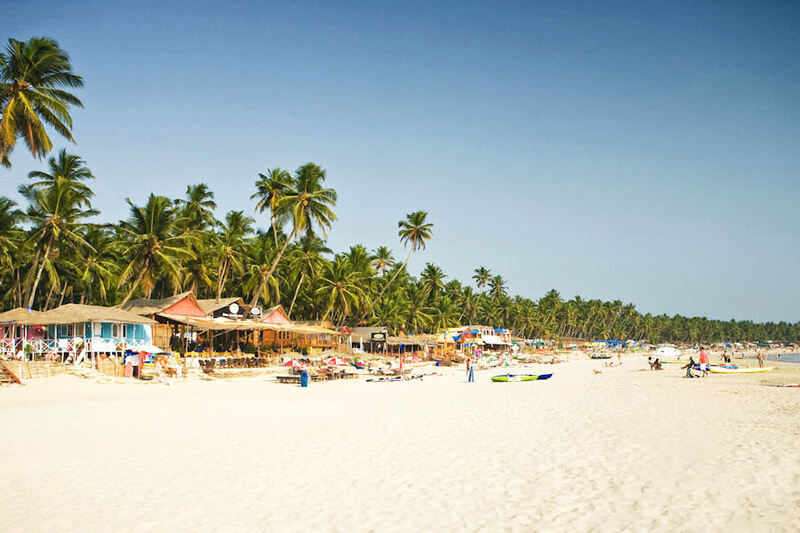 The beach is lined with shacks and stalls, and Colva gives the impression of a North Goan beach. Some of the shacks serve pretty amazing seafood and drinks. If you’re looking for quieter spots, wander away from the centre and laze around in the white sands of the beach or go swimming. Beautiful homes and villas dot the village as this was historically the getaway of the rich in Margao. Apart from the beach, the Menino Jesus statue in Our Lady of Mercy Church is worth a visit. Its annual religious celebration, the Fama of Menino Jesuse, celebrated every third Monday in October, is one of the biggest feasts in Goa. 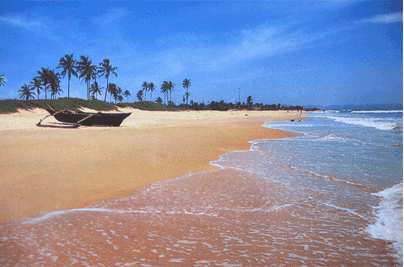 With Benaulim begins the pristine and peaceful beaches that this side of Goa is famous for. Lined with palm trees, the white sands and blue waters of Benaulim are perfect for relaxing. When you are in Benaulim, you got to indulge as all the resorts are on the luxurious side. Benaulim is surprisingly great in options for water sports as well. After you go for a swim or indulge in some water sports, do visit the Goa Chitra Museum. It is a great attempt by Victor Hugo Gomes, an artist, to collate various traditional objects of the state that were slowly no longer being used. The guided one-hour tour is worth the while, as a material history of the state is offered in an assortment of various objects. 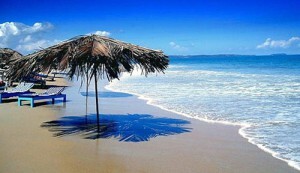 Visit Betalbatim and Bogmalo beaches, which are nearby as well. The former is great for water sports and the latter is a top corporate outing destination. Cansaulim is a quiet beach between Colva and Bogmalo. The nearest airport is Dabolim Airport or the Goa International Airport, which is 25 kilometres away from Benaulim. Trains ply to Margao, from where Colva is 8 kilometres away. The nearest bus stand is also in Margao. The best way to travel to Colva and Benaulim from here is by road. Try renting a car as it can turn out cheaper than a taxi. Travel by bus from Margao, or rent a car or taxi. Top Places to Eat: The beach shacks in Colva are great for food and drinks. The Leda Lounge and Restaurant is a great nightspot for some music and drinks. Mickey’s in Colva is also pretty good, in a picturesque setting. Martin’s Corner in Betalbatim is legendary for its seafood, and this is a good enough reason to visit the beach. Margao, also known as Madgaon, is the main city of South Goa. This is the pit stop for stocking up on essentials, and for accessing other parts of South Goa. Madgaon has a major bus stand of Goa, the Kadamba Bus Stand, where most long distance buses arrive. Its railway station is the only stop for many long distance trains in the entire state. Margao is thus a great starting point to access the rest of Goa. There isn’t much to see in Margao, except the Church of the Holy Spirit and the area surrounding it. The Church was built in 1675, and has grand and intricate interiors. Largo de Igreja, the area surrounding the Church, was a Portuguese settlement and has many old mansions in various stages of ruin, though some are well maintained. Margao also has good options for shopping, and its shops are open throughout the year, unlike the seasonal stalls next to the beaches. Margao is a great place to explore the villages of Goa. While its beaches are the sure attraction of the state, its villages have an unbeatable quaint charm. The pace of life is leisurely, and guaranteed to make you never want to leave. Chandor is a beautiful village steeped in Portuguese influences, best exemplified by the majestic Braganza House. In Loutolim, one of Goa’s prettiest villages, is the Ancestral Goa project, which showcases the culture and heritage of the state in exquisite detail. 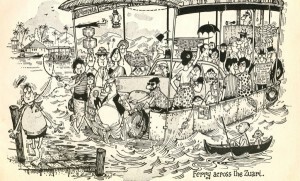 Be sure to visit the art gallery of Mario Miranda, Goa’s most famous cartoonist. Not only are his illustrations brilliant, they give you the critical insider’s view of Goa and its people. Loutolim is also rich in Portuguese influences, with a great many mansions, though only the Casa Aruajo Alvares is open to public. Visit the Palacio do Deao built in the eighteenth century by the founder of the town of Quepem. These villages, steeped in greenery and rich history, give you a strong sense that time seems to pass slower here than in any other part of the world. It’s a magical world for sure, one that stays with you for a long time after you leave. Travelling in Margao is easy as there are many local buses and pilot bikes. You can travel to the villages by bus or taxi, or rent a car or bike. If you want to aimlessly explore, rent a bicycle and roam around the villages, soaking in the place. Top Places to Eat: Fernando’s Nostalgia, on the way to Loutolim, offers some of the best food in Goa. Spend your holiday in Varca, Cavelossim and Mobor if you want to get away from it all and laze around in spotless white sand and blue beaches. The five star resorts which stand on the shores of these beaches carefully tend to the beachside, making it virtually litter free. Varca is a beauty of a beach, surrounded by lush greenery and a quiet village, making it the perfect retreat from everyday life. The village is engulfed in green, and this along with the beach situates you right in the midst of nature. Both the village and the beach are great for some solitude and quiet, perfect for meditation and alone time or a romantic honeymoon. The whitewashed churches that you find here and there in Varca are bustling centres of activity when it is the time of a religious fest. Cavelossim is the busiest beach among the three. The town is filled with jewellery, clothes and souvenir shops. The beach, however, is as peaceful as Varca and Mobor. The contrasting white sand and black rocks of Cavelossim are beautiful, and you can spend hours lazing under the sun. The beach is dotted with shacks and a lot of options for water sports. Paddling is a popular option here. Mobor is a tiny beach, at the end of the beach stretch that begins from Varca. The journey from Varca to Mobor is peaceful and picturesque. Fishing boats line on one side of the beach. Mobor is great if you want to spend time doing nothing. This is as peaceful as it gets. You can also interact with the local fishermen when they return with their catch. Or you can just choose to sit still and take in all the beauty around you. Buses to Varca and beyond ply every few minutes from Margao. You can also choose to rent a car or motorbike or travel by taxi. Top Places to Eat: Jolinn in Varca couples great food with warm service to draw you in more than once. Fisherman’s Wharf in Mobor offers a mix of continental and Goan cusine. 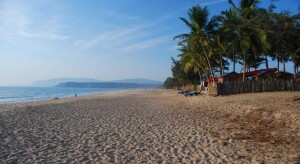 Agonda and Palolem have a laidback air which characterizes the beaches of South Goa. Agonda is popular as a stopover before going to Palolem. Agonda has shacks which sell cheap items, and a very quiet beach. The shacks lining the beach are fewer in comparison to other beaches, but gradually rising in number. You can also go for cooking, yoga and meditation classes here. In winter, Agonda is a protected nesting ground for Olive Ridley turtles. For many, Palolem is Goa’s best beach. This is probably because there is something here for everybody. A picture perfect beach, Palolem comes to life in season. A headphone party here is a must do. If you want to enjoy the beauty of the beach, come before the season begins, and Palolem is magical. There is a lot to do here. One of the safest places in Goa to go swimming, there are developed water sports options, the most popular being kayaking and paddle-boarding. You can also go cruising. Other than the beach, you can also enroll for cooking or yoga classes. The beach is popular with a wide mix of people: backpackers, families, honeymooners, solo travelers and gangs of friends. There is something for everyone here, and not being as crowded as the North Goan beaches, there is a sense of leisure that accompanies whatever activity you’re engaged in. South of Palolem is Patnem, where shopping is cheaper than around other more popular beaches. The beach is relaxed, though not developed all that much. Travel by bus, which is the cheapest. If you prefer a journey at your own pace, rent a car or pay for a whole day taxi. Top Places to Eat: Dropadi and Cafe del Mar in Palolem are two popular places to eat, offering a variety of cuisines and yummy seafood. So, what are you waiting for? Explore South Goa and you won’t regret it. Don’t forget to share your adventures with us!